Synonyms: Feronia limonia, Limonia acidissima, Schinus limonia. Common names: Wood Apple, Elephant Apple, Monkey Fruit, Curd Fruit. Common Hindi names: Kaitha, Kath Bel. Plant: Erect slow growing tree. Leaves: Deciduous, alternate, 7.5-12.5cm long, dark-green, leathery, dotted with oil glands and slightly lemon-scented when crushed. Flower: Dull-red or greenish flowers 1.25 cm wide, borne in small, loose, terminal or lateral panicles. Usually bisexual. Fruit: Round to oval, 5-12.5cm wide, with a hard, woody, grayish-white, scurfy rind about 6mm thick. The pulp is brown, mealy, odorous, resinous, astringent, acid or sweetish, with numerous small, white seeds scattered through it. The wood-apple is native and common in the wild in dry plains of India and Ceylon. The rind must be cracked with a hammer. The scooped-out pulp, though sticky, is eaten raw with or without sugar, or is blended with coconut milk and palm-sugar syrup and drunk as a beverage, or frozen as an ice cream. It is also used in chutneys and for making jelly and jam. The jelly is purple and much like that made from black currants. The fruit shell is fashioned into snuffboxes and other small containers. Oil derived from the crushed leaves is applied on itch and the leaf decoction is given to children as an aid to digestion. 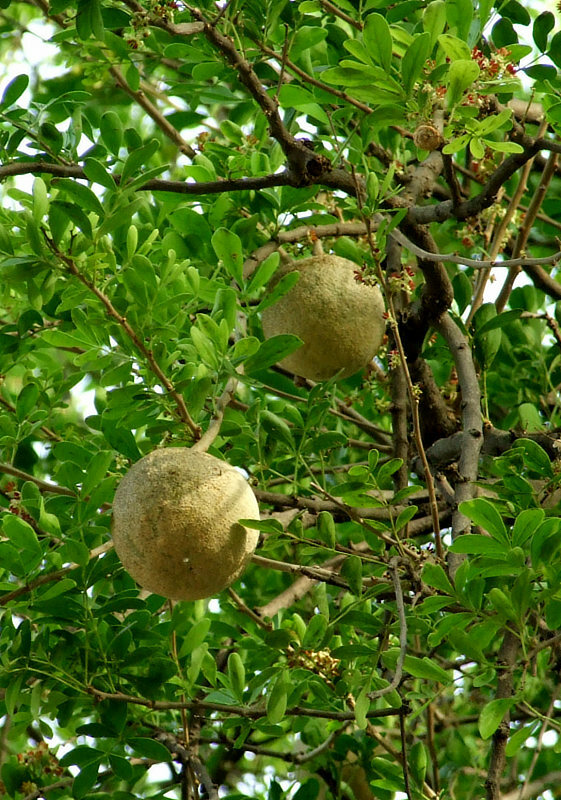 Leaves, bark, roots and fruit pulp are all used against snakebite. The spines are crushed with those of other trees and an infusion taken as a remedy for menorrhagia. The bark is chewed with that of Barringtonia and applied on venomous wounds. What a interesting fruit of Elephant apple which I have not seen before till now my friend. Great composition and DOF. Perfect shot. Many thanks sharing this! I am learning with your captures my friend. Thanks a lot! Perfect capture of this beautiful Elaphant Apple tree and its fruits. TFS. A very useful plant indeed, and a nice shot of its fruits, very good! Very good shot, beautiful colors and details.